Dengue fever is on the move. This mosquito-borne viral disease is invading new parts of the world, helped by climate change, urbanization and increased travel. 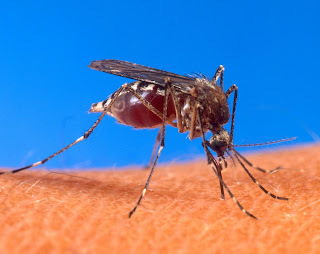 Europe last autumn had its first big outbreak since 1920 on the Portuguese island of Madeira, while in Florida, where Dengue fever was largely eradicated in the 1930s, around 10 cases were reported in August. With no approved vaccines on the market to fight the virus, this DOTW reporter was heartened to learn that Johnson & Johnson’s Janssen Inc. is joining the hunt for drugs to treat the world's fastest-spreading tropical disease by linking with academic researchers in Belgium and Britain’s Wellcome Trust medical charity. The tie-up between Janssen and researchers at the University of Leuven, who have received backing from Wellcome, will build on the discovery of a series of chemical compounds that are highly potent in preventing the replication of dengue virus. The compounds, which have yet to be tested in clinical trials, are active against all four types of the virus and have been shown to work in animal tests. Janssen will have the option of an exclusive, worldwide license to progress and commercialize compounds developed through the research program. Financial terms were not disclosed but Janssen will make upfront, milestone and royalty payments to the University of Leuven. The collaboration, although long-term, reflects confidence in the feasibility of making an effective medicine against Dengue fever, which is sometimes known as tropical flu. Dengue fever is spread by the Aedes aegypti mosquito, which is now found in 150 countries. To put concerns in context: malaria causes more deaths, but it is on the decline and affects fewer than 100 countries, according to the World Health Organization (WHO). Dengue fever, on the other hand, affected only a handful of areas in the 1950s, but is now officially present in more than 125 countries, exposing half the world's population to the disease. The danger is greatest in the developing world, but the disease is also prevalent in the southern U.S. and parts of southern Europe. Aedes mosquitoes are now present in 18 European countries, often arriving via the importation of bamboo and second-hand tires. Sanofi/Pozen: Sanofi Pasteur’s parent Sanofi has signed a license agreement with Pozen Inc. on the commercialization of Pozen's new-and-improved aspirin therapies, being developed to reduce gastric ulcers in cardiovascular patients. The deal, which could generate more than $35 million for the U.S.-based company, gives Sanofi exclusive U.S. rights to commercialize all of Pozen's combination drugs containing the proton pump inhibitor immediate-release omeprazole and 325 mg or less of enteric-coated aspirin. This refers currently to Pozen's PA8140 and PA32540 tablets. PA32540/PA8140 layers 40 mg immediate-release omeprazole (Prilosec) around aspirin to provide the cardiac benefits of once-daily aspirin therapy while reducing the risk of aspirin-induced gastric ulcers. PA32540 contains 325 mg aspirin while PA8140 contains 81 mg aspirin. The Chapel, Hill N.C.-based company has built a business around developing fixed-dose combination drugs, which are sold through its partners GlaxoSmithKline PLC and AstraZeneca PLC. Prozen previously said it planned to go it alone on PA32540 after frustrating relationships with its big pharma partners and disappointing sales of its migraine treatment Treximet (sumatriptan/naproxen) and pain reliever Vimovo (naproxen/esomeprazole). Its latest deal will see Sanofi pay Pozen $15 million up front, with Pozen eligible to receive pre-commercial milestone payments of $20 million and additional payments upon achievement of certain sales milestones. Pozen will also get double-digit tiered royalties on sales of licensed products by Sanofi and its affiliates in the U.S. Sanofi will have responsibility for all sales, marketing, ongoing manufacturing and future development for the licensed PA products in the U.S. Pozen will keep responsibility for obtaining approval of the NDA, after which Pozen will transfer the application to Sanofi. The application was submitted on March 27 and accepted for filing in May by FDA. - S.S.
Otsuka/Astex: While the California biotech wouldn’t reveal how long it’s been on the block, Astex Pharmaceuticals Inc. said it found its highest bidder in Japan’s Otsuka Pharmaceutical Co. Ltd. The deal, revealed Sept. 4 by a Japanese news organization, has Otsuka paying $8.50 per share for all outstanding shares of Astex, a 48% premium to the company’s 30-day moving average, and above its close of $6.68 on Sept. 3, the day prior to the deal announcement. Otsuka is expected to issue a tender offer within 10 days that will remain open 20 days. The transaction has been approved by the boards of both companies. The deal is expected to close in the fourth quarter. Ultragenyx/Kyowa Hakko Kirin: Rare disease company Ultragenyx Pharmaceutical Inc. has partnered with Kyowa Hakko Kirin Co. Ltd. to develop and commercialize a treatment for X-linked hypophosphatemia (XLH). This is the first pharma partnership for the high-profile biotech, which raised a $75 million Series B round in late 2012 that included several crossover investors. Baxter/Coherus: Pfizer Inc. and Amgen Inc.’s blockbuster Enbrel (etanercept) may have won extended patent coverage in the U.S., but at least two biosimilars that could challenge the drug in certain territories are under development. The latest will come from a Sept. 3 partnership between Baxter International Inc. and Redwood City, Calif.-based biosimilar specialist Coherus BioSciences Inc., which will collaborate on development of an etanercept alternative in Europe, Canada, Brazil, and other unspecified locales. Baxter will pay Coherus $30 million up front, plus up to $216 million in additional payments contingent on clinical development and regulatory milestones, according to the deal terms. It’s not yet clear whether they’ll pursue approval in Enbrel’s largest indication, rheumatoid arthritis, or whether the companies will aim for psoriasis, psoriatic arthritis, ankylosing spondylitis or another autoimmune-related indication. Novartis/Regenerex: Novartis AG and Regenerex LLC have inked an exclusive global licensing and research collaboration based on the Kentucky-based biotech’s hematopoietic stem cell-based FCRx platform. Regenerex’s Facilitating Cell Therapy (FCRx ) has shown encouraging results in Phase II trials involving 15 kidney transplant recipients, inducing stable immunological tolerance and graft survival without the need for lifelong immunosuppression. Currently, solid organ transplant recipients need immunosuppressive drugs for life to prevent rejection. FCRx is an allogeneic hematopoietic stem cell based therapy platform that also contains facilitating cells derived from a donor. The platform supports the development of tolerance, or "bone marrow chimerism," in transplant recipients and the two hope chimerism will eventually render recipients tolerant to cell, tissue or organ transplants from the same donor, enabling transplant patients to discontinue immunosuppressive medications after building stable immunological tolerance. Beyond transplant, the partners will study FCRx’s potential for correcting serious genetic deficiencies such as inherited metabolic storage disorders and hemoglobinopathies, examples being metachromatic leukodystrophy and sickle cell disease. The companies did not provide financial details or timeframe for their collaboration in the Sept. 6 announcement. Novartis did say that the FCRx platform will broaden its current cell therapy portfolio, which includes two novel cell therapy platforms initially being investigated in hematological malignancies. HSC835, currently in a Phase II trial in patients with high-risk hematological malignancies, is a novel cell therapy approach that enables an expanded single umbilical cord blood derived hematopoietic stem cell transplant in patients with limited treatment options. A second cell therapy product, CTL019 is a chimeric antigen receptor T cell therapy currently in Phase II development in acute lymphoblastic leukemia (ALL) and chronic lymphocytic leukemia (CLL). - S.S.
Santhera/Takeda: Santhera Pharmaceuticals AG of Switzerland reached agreement with Takeda Pharmaceutical Co. Ltd. on Sept. 3 to license back the European rights to its Phase III Duchenne muscular dystrophy (DMD) drug Catena (idebenone), increasing the Swiss company’s commercial flexibility. In return, Takeda gets an undisclosed percentage of future licensing and/or sales income generated by Santhera in DMD. Takeda acquired exclusive marketing rights for the medicine in Europe in 2005. Idebenone is a synthetic short-chain benzoquinone and a cofactor for the enzyme NAD(P)H:quinone oxidoreductase (NQO1) capable of transferring electrons directly onto complex III of the mitochondrial electron transport chain, thereby capable of restoring cellular energy levels. The drug is in a DMD Phase III study conducted in Europe and the U.S. Santhera also obtained the right to cross-reference Takeda's idebenone data for regulatory use in any indication in any territory. If Santhera makes use of the cross-references, Takeda is eligible to obtain a percentage from future licensing and/or sales income generated by Santhera in such indications. The two companies also ended a 2005 agreement for idebenone’s use treating Friedreich's ataxia. Santhera's €1 million ($1.3 million) contingent liability payable to Takeda under that has been waived, but Takeda is eligible to receive €1 million as a percentage from future income generated by Santhera to offset this.- S.S.